This one-page overview provides insight in the interactions between the different project topics, such as scope, time, cost, risk, team, etc. The Project Model Canvas works as a structured information framework, making it easy to communicate with those who are unfamiliar with existing PM methods such as PMI-PMBoK®, Prince2™ and others. PM Studio™ has incorporated the Project Model Canvas into the PM Studio Platform as a visual tool for starting a project and bringing an idea into reality. 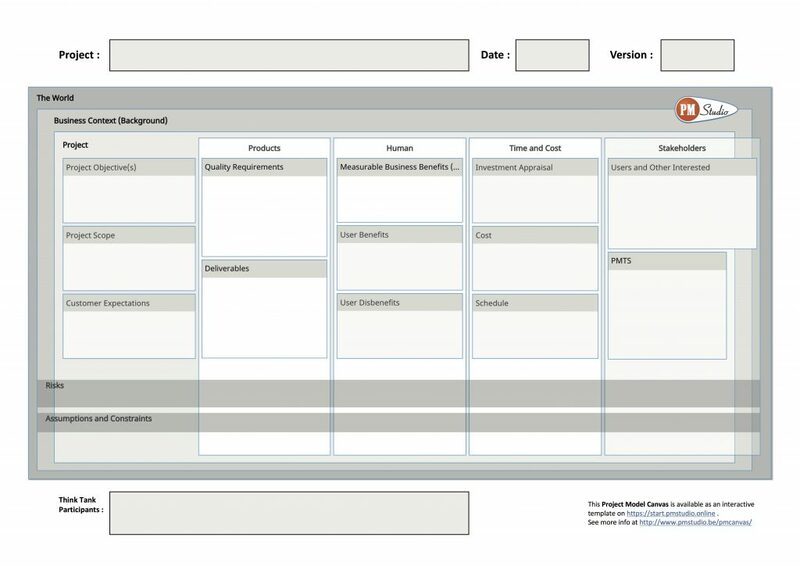 Interested in a Project Model Canvas workshop ? We can do this In-Company at your request. Here is a short video from a mini workshop during the “Dag van de Projectmanager 2017” congress, organised by Kluwer.